I must admit to a huge fondness for the Scarlet Pimpernel character. Sir Percy Blakeney for president, as far as I'm concerned. Sink me! There's something breathtakingly appealing about a man who is willing to sacrifice everything, including the love of the wife he adores, to save innocents from death and torture. He's clever and he's witty and he's suffering (because of said wife). Who can resist him? Baroness Emmuska Orczy penned this swashbuckler in 1905 and it's been a hit ever since. It's a rare writer who can create a fictional character who becomes part of the culture. You really have to capture people's imaginations for one of your creations to achieve such immortality. Actually the weird thing about doing this review is that right now I'm writing a vaguely Pimpernellish hero. Secret identity? Tick. Snappy dresser? Tick. Sharp and clever tongue (no comments from the peanut gallery)? Tick. Self-sacrificing heroism? Well, maybe he has to work on that, but he gets the idea by the end of the story, thank goodness. And when he gets the idea, he gets the girl. This particular hero of mine has been germinating in my mind for months but it never occurred to me until a good friend, Denise Rossetti, recently suggested THE SCARLET PIMPERNEL as a future review for the Romance Dish that it was time to re-visit the original model. Ha! Sometimes things are more obvious than the nose on your face and you still don't see them! I read this book many years ago (if I tell you how many, I'll have to kill you). I remember getting it out of the school library in grade eight after I saw the 1934 British film late one night. That movie stands up surprisingly well for something that old - Leslie Howard makes a very dashing Pimpernel and Raymond Massey is a great baddie. I never really warm to Merle Oberon but you don't really watch this movie for the gals. The version of THE SCARLET PIMPERNEL that I absolutely adore is the 1982 one with an incredibly handsome Anthony Andrews who conveys a tormented heart in a most picturesque fashion. Again, I'm not crazy about the Marguerite in this version either. Jane Seymour is an icy beauty, a bit like Merle Oberon. But I dare your heart not to flutter when AA stares longingly at the wife he thinks is a French spy. Sigh. So when I picked up the book for this review, I think it's fair to say that my principal recollection of the story was via the screen. So my re-read offered a couple of surprises. The first is that the book is almost completely told from Marguerite's point of view. Just a quick precis of the plot for anyone who hasn't read/seen it. During the French Revolution's Reign of Terror, a mysterious Englishman called the Scarlet Pimpernel and his band of brave lieutenants spirit large numbers of aristocrats out of France to safety in England. Nobody knows who the Pimpernel is but the French government would dearly like to know so they can catch him and send him to the guillotine. He's a master of disguise and fiendishly clever and he's making fools of the French authorities. A French agent, Chauvelin (boo, hiss), is sent to London to ferret out the Pimpernel's identity. Chauvelin blackmails beautiful Frenchwoman and former actress for the Comedie Francaise, Marguerite Blakeney, to discover the Pimpernel's identity. If she doesn't cooperate, her brother will go to the guillotine. Marguerite marries foppish Sir Percy Blakeney after a whirlwind courtship. On the day of their wedding, Percy learns that Marguerite betrayed an aristocratic family to their deaths and things have been pretty sour in the marital home since then. Marguerite has come to despise her husband, who minces around the court wearing fancy clothes and making bad witticisms (except they're kinda cute, but then I like a good/groanish pun). Secretly, she's more than half in love with the dashing SP but agrees to unmask him when Chauvelin threatens her brother's life. Much intrigue and derring-do follow until Marguerite discovers that Percy is the Pimpernel and Percy discovers that the woman he adores is worthy of his love after all. All this with foiling the bad guy and rescuing another bunch of aristos? Bonus! Anyway, getting back to the book. I was surprised at how little Percy is present in the story compared to the dominant role he takes in the movie versions. Much of the book, in between the intrigue, details Marguerite's unhappiness and disappointment in her marriage. Having said that, the story absolutely gallops along. If you think something written in 1905 is going to be slow and staid and stuffy, think again. One disappointment for me - and this probably has something to do with literary fashion in 1905 - is that the Baroness gets shy at the end when Marguerite and Percy have finally discovered each other and they're in love and you know, mush, mush, mush. Here, there isn't much mush and I WANT MY MUSH! My fingers itched to take up my pen and write the scene where they each declare their love and how silly they've been to doubt one another. You know, the last chapter of your standard romance novel. But still, I suppose you can't have everything and there's plenty to enjoy in THE SCARLET PIMPERNEL. This book definitely qualifies as a romance classic. It's interesting to re-visit the books that established romance as such a popular genre and the character archetypes who still appear in modern stories. So have you read THE SCARLET PIMPERNEL? Have you seen any of the screen versions? Do you have a favorite? Why do you think Percy Blakeney/SP has enjoyed such enduring popularity? THE SCARLET PIMPERNEL. Oh the shame! I promise to rectify this sad situation ASAP! Flora, REALLY??!!! You've got such a treat ahead of you. Seriously grab the DVD of the Anthony Andrews version. I swear you'll fall in love! I second Anna's rec of Anthony Andrews as SP. Fantastic! Flora, I suspect like me you'll have a great big crush on AA once you see him in the SP! Hi Anna, terrific review! Snorted at the MUSH and HUZZAHS. Of COURSE you like SP - it's the puns. Why hadn't I realised it before? You just can't help yourself, can you? As you know, SP is one I haven't read, though my mum loves it. I've settled for the screen versions. The old B&W one is fun. The Anthony Andrews one is too. And I rather enjoyed the TV adaptation with Richard E Grant as the SP. He can mince with the best of them. And as a bonus, Martin Shaw played Chauvelin in that series. Br - that deep voice of his sent shivers down my spine (in a good way). OK, OK, I'll have to read the book now. I haven't seen the Richard E. Grant version, Annie. I may have to check that out though it would have to be exceptionally good to surpass the AA version for me! PJ, it was an English television series from probably the late 90s, I suspect. Definitely worth a look! I had a few problems with the TV series - PB was a bit too inclined to shoot and ask questions later although I liked the way they developed the relationship with Marguerite in the first series. And then they killed her off in the second series. Sink me, it's just not on! I do however agree that MS made a wonderful villain. I loved The Scarlet Pimpernel so much it influenced a book I wrote. Anthony Andrews was great as was Richard E Grant. I haven't seem the B & W one, but I'd like to. Maggi, see if you can find the old one. It's a hoot and will forever wipe wimpy Ashley Wilkes out of your mind when you think of Leslie Howard. Yeah, I'm having fun with my Pimpernellish character too! It's been ages since I read the book. I have seen a number of different versions on television, but long. long ago. I don't recall many details. I should hunt up the book & then the DVD's. Mary, check it out again. I had enormous fun with the re-read and I really want to see the gorgeous AA again as Percy. I used to own the video but I lent it to someone and they never returned it, a pox upon their house. I have it on my kindle but haven't gotten to read it yet. I have been trying to figure out how to determine what I have read and haven't read on my kindle and am having issues. Dianna, for some reason your email made me smile. No technology ever quite works straightaway, does it? I've got some new appliances hitting me this week and I'm expecting similar teething troubles. It's not the appliances' fault, it's my brain! Not to mention I am of a certain age and I think the brain cells deteriorate faster as you get older. I've never read it or seen any of the films, but I may have to now! Our theater department at school actually performed this last semester and now I wish I had gone! Trisha, the play is great fun. I saw a very pantomimish version in London one year although sadly Percy was played by an ageing knight of the British stage and didn't have quite the dash he needs. It's such a great story! May, I was surprised that Marguerite was actually the centre of the story in the book. We really see little of Percy - I could have done with seeing more although I wonder if we do in the sequels where I'm guessing they start working together to save the aristos. Must check them out. Odd how both Merle and Jane are that similar icy beauty type, isn't it? Must be something in the casting directors' image of the character. I thought she was quite a warm, sparkling woman in the book. Anna, Anna, shame on me. I've heard of it and never read it. But, I now will! Leslie Howard would be a good SP because I always thought he was kind of foppish in GWTWind. (Just my opinion.) But, I've never seen the movie, so can't give a review on it. Wow, Deb, seriously, grab the Anthony Andrews DVD. It's available because I got it from my local video renter. Leslie Howard is MUCH better as the Pimpernel than he is as wimpy old Ashley. But I definitely vote for more mush! There's quite a lot of mush in the Anthony Andrews version. Maybe that's why it's my fave. "Is he in heaven or is he in hell? / That damned elusive Pimpernel." Of course I've read TSP. :) I liked the Anthony Andrews movie, but I can't separate Leslie Howard from Ashley Wilkes. I once offended someone on a blog beyound apology when I said I didn't understand how Scarlet could have been in love with Ashley with Rhett around. She saw Leslie Howard through the lens of his Pimpernel role. I think an argument could be made that most of the secret identity heroes in Western culture owe a debt to TSP, as do obviously Lauren Willig's Pink Carnation books, which I adore. Hi Janga! Did you see my Tweet about how much I loved the first Julia Spencer-Fleming and I've ordered the rest? Great book! I read the first Pink Carnation book and loved it - must get back and read the rest. You're so right about it being a tribute to the Scarlet Pimpernel. Anna, I did see your tweet, but days after you sent it. I haven't been on Twitter much lately. I'm having to ration social media to get any work done. I'm so glad you enjoyed Julia Spencer-Fleming. Not only is she a brilliant mystery writer, but she's also a romance fan. Yay! And what treats you have in store with the other eight Willig books!The new one is a particular delight with a bad poet and his critic as H/H. Oh, I hear you on social media. I'm taking a couple of days between projects so I'm going to wallow in Social Media and then it's back to the grindstone. Thanks so much for the recommendation - I would never have found them otherwise. Love that bristling sexual tension and forbidden love angle. Love bad poets - featured one in Midnight as you know! I haven't read the book, but ages ago I did see the movie. I don't remember which actor or who the ladies were. I plan on checking for it and try to watch it again. Dalila, you'll have great fun with it! I whipped through the book in a couple of hours. Great stuff. I read The Scarlet Pimpernel in high school. It's one of my favorite books. I even managed to track down the sequel to it several years ago. I believe that Baroness Orczy wrote several sequels, but for awhile, they weren't published in the US. I don't know if that's changed. I enjoyed all 3 film/tv versions that I've seen. The Anthony Edwards/Jane Seymour miniseries was probably the best. Have you read His At Night by Sherry Thomas yet? The story is very much like The Scarlet Pimpernel. Suzanna, I was lucky enough to see REG as Henry Higgins in My Fair Lady a couple of years ago. He was wonderful! Suzanna, he's very, VERY tall and very lean and I was blown away at how good he was at physical comedy. Andrea, maybe the Scarlet Pimpernel is tied more closely to British culture (a lot of Australian stuff still owes its life to British roots). Surprised so many of you North American gals haven't seen the movie/read the book. He's part of the culture here. Definitely grab the AA version - it's fab! 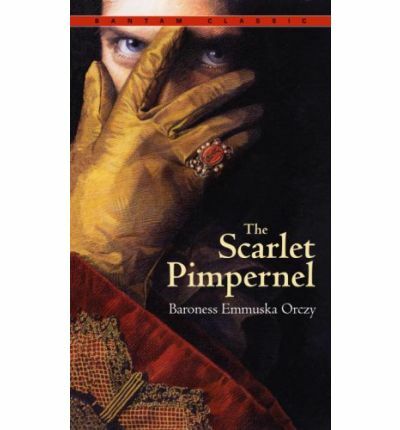 The Scarlet Pimpernel sounds vaguely familiar, therefore I've heard of it but likely have never read it. Now it makes me curious to do so. Na, looks like there's going to be a line at the DVD counter for the Anthony Andrews Scarlet Pimpernel. Couldn't happen to a nicer fop! LOL! I had a look again at THE SCARLET PIMPERNEL in the centenary year and what struck me was how modern it was. The heroine is an admired and respected professional 'the cleverest woman in Europe,' and married Percy because she was simply overthrown by the sheer passion he felt for her. And when the scandal flares up - and it's pretty bad, her words sent a family to their death on the guillotine - she is just too proud to explain to him that she was tricked into it. And he has too much integrity just to accept what she's done, however much in love with her he is. He stays polite but he - withdraws. As a picture of an estranged marriage it is spot on. There's a scene which doesn't get into any of the movies, I think, where they fence verbally in the moonlight, after a party. She tries to seduce him. He holds out - just. Absolutely crackles with sexual tension. Um, think I must read it again. Thank you for reminding me. Jenny, do you remember the ending of that scene in the moonlight? Absolutely heart-wrenching. POOR Percy! POOR Marguerite! Actually that scene in the moonlight I think would have to be my fave in tghe whole book. I'm going to chase up the sequels now. As you say, it absolutely rips along, not a dull moment. I really, REALLY wish we'd got the big awwwww moment at the end, though. Love that bit in a book! There were loads of sequels (11?) but my favourite is I WILL REPAY, where the heroine does the unforgivable to the hero and you understand why and then she braces up to pay for it. And the hero, whom she has betrayed .... no, I'm not giving a spoiler. But it's edge of the seat stuff, trust me. Ooh, thanks for the recommendation. Oh, man, I'm doing to drown under the TBR pile at this rate! Read an Eva Ibbotson last week (the lovely Dragonfly Pool) and thought of you! I haven't read the book, but I have seen the version with Leslie Howard. BTW, I really love that cover. Gorgeous! Gannon, there are a million versions available but this is the one I bought, partly because the cover was so pretty. The book's great fun! Anna, I not only have read The Scarlet Pimpernel but own a copy of the book! (It lives in the same bookcase as my hardcover Dunnetts.) I also have the Howard/Oberon version, unfortunately made from a deteriorating negative and not remastered. And I remember the Andrews/Seymour version, which I think may have been a Hallmark Hall of Fame special. I believe the Andrews version featured then-rising Shakespearean actor Ian McKellan as Chauvelin. Nancy, I don't remember if it was a Hallmark special but it was on television. You're also right about Ian McKellan as Chauvelin! Nancy, Ian M makes a wonderful Chauvelin! Hey, clearly you're another fan - I probably could have guessed that, LOL! Hey, thanks, guys for a great day of discussion of one of the all-time classics! Sink me! "They seek him here, they seek him there, those Frenchies seek him everywhere... Is he in heaven, or is he in hell? That damn'd elusive Pimpernel!" Sink me, but don't I adore the Anthony Andrews version of this story! I have it on DVD and I watch it at least once a year. Ian McKellan was thoroughly vile as Chauvelin! I loved it when he got his comeuppance! Linda, sounds like you're ALMOST as big a fan of AA's SP as I am ;-) It really is breathtakingly romantic, isn't it? Eli, try and get hold of the Anthony Andrews DVD. It's a great into. And the book is great fun too. I haven't actually read the book version, but I felt compelled to read DRACULA for the reason you state about revisiting the genre-establishing classics. I was totally impressed by how scary and moody it was. Totally holds up. Julia, the separated birth thing is getting creepy. The lovely bookseller we had at my Thursday night library talk gave me a lift home and she was saying she was reading Dracula. Both of us agreed, it's still genuinely creepy. In spite of every other vampire take we've seen, in spite of the spoofs. Oh, don't you love Anthony A's way with a quizzing glass? Sigh. Oh, man, I need to watch this again pronto. Sadly, my video was stolen (a loan that never returned) and my DVD place has closed its doors. I'm longing the way Sir Percy is longing for Marguerite. The Hollywood Reporter says that a $120 million movie based on Baroness Orczy's classic "The Scarlet Pimpernel" is in the works at UK's Fairbanks Productions, from Dominick Fairbanks, the great grandson and grandson of Hollywood legends Douglas Fairbanks and Douglas Fairbanks Jr.
British actor Neil Jackson (Quantum of Solace) would star in the production. "We want to try and do to the story of 'The Scarlet Pimpernel' what Guy Ritchie did to 'Sherlock Holmes' [for Warner Bros]," said Fairbanks Productions executive producer James Black. The trade adds that they are planning on shooting the film late next year, "somewhere in Eastern Europe," according to Black, with a host of "high profile cameos" in the movie. I don't remember ever reading it, but probably have it stashed with my classic books. Now I have to dig it out and read it. I know I have seen it in filmed form on TV and liked it. I hope the new movie is a good one that does the story justice. I'll need to look for the older versions and watch them. Thanks for the reminder about this story. Pat, this story just keeps upon coming up, doesn't it? I think that's the sign of a true classic. Not sure I want a steampunk version, though! LOL! I just looked up Neil Jackson. He's VERY handsome in the Anthony Andrews mold!